Inspired by the famous desert courses of Arizona & California, The par 72 international championship Indiana course is the first desert course in Europe and has been built to full USGA specifications and the quality standards of these desert courses, now famous for the quality of golf that they offer. It presents unforgettable views, and golf of such a dramatic nature that it can be said to have taken not only desert golf, but also golf in general in this part of Spain to a new level of excellence. Over 600,000 cacti and other desert plants grow progressively more dense and troubling, the further your shot is off the fairway, culminating in the dreaded “spiked lies”, so the course is both demanding and exhilarating, providing a variety of shot making challenges to test the skill level of every player, from the beginner to professional. "We have created a course which really can be enjoyed by players of all different standards, we have kept the fairways generous and ensured that the less expert player can enjoy and improve his game whilst absorbing the awesome landscape and views that encompass The Indiana. On the other hand, every hole has features which can be brought into play; the springs, watercourses, dry river beds, rock and cactus areas and bunkers are strategically located to examine the skills of golf's leading players when playing off the championship tees." 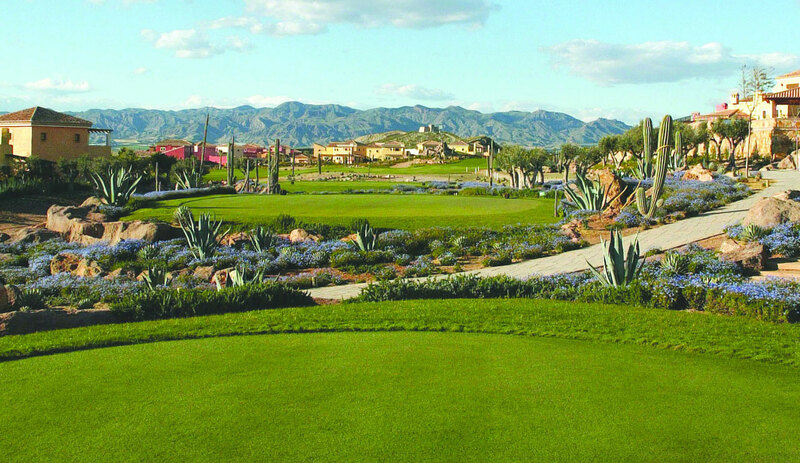 The aim of the Desert Springs Golf Club is to offer golf in its very best traditions within a relaxed atmosphere of camaraderie and good fun, to provide the best possible golfing experience to all golfers, members, guests and visitors alike and to ensure that the Indiana Course can be enjoyed by players of all abilities. The Club and the Course are managed to achieve just this, with respect for the etiquette and courtesies of the game being a particular feature. Our commitment is to do what we can to exceed your expectations, with a truly warm and friendly welcome and an uncompromising level of service that you would not expect this side of the great pond. Desert Springs is different and the quality in depth of that difference becomes apparent from the moment you arrive. Beside the Standard Green Fee and Buggy Hire rates, please see the PDF below for our special offers available such as the 'Early Bird' as well as the 'Cactus Combo' rounds. "Having last been here in 2004, the first thing I noticed was how mature the landscaping had become. It's a course that provides you with a test for every shot you have in your bag. The course is in immaculate condition with greens of equal quality to those we play our own tour events on. If you want to hone your game, immaterial of what standard of golfer you are, then this is the place to come!" “Desert Springs is a very stimulating test of golf. It is a thinking mans course, not easy to overpower but one that requires excellent course management skills. I really enjoyed it and felt it tested my skills fully”. “I actually found myself hitting my driver a lot at Desert Springs. It is a course that demands accuracy and thought but it does allow you to attack and make birdies. I found it a superb looking course and in top class international condition. It is a genuine test”.
" Loved the course; a proper shot making course. I made loads of birdies, which was great, but I got penalised for bad shots. That’s the way the best courses treat you. One of the most refreshing courses I’ve played in along time and one I look forward to re-visiting, I don’t think it would ever be boring”.